Again the Suzuki is also in big three manufacturers of cars in Pakistan. They are called “Pak Suzuki” in Pakistan. Recently they have celebrated the 2 millionth car production in Pakistan and count continues to rise. Recently they have stopped production of their most popular car ‘Suzuki Mehran’ after producing over 700 thousand units. Latest prices of the Suzuki cars are as follows. Although just recently Pak Suzuki have stopped the production of its Mehran cars, however, the units already produced will be sold. Also the orders/bookings received until the 4th of April 2019 will be fulfilled. Suzuki Mehran falls in 800 CC engines category. So most recent prices of Suzuki Mehran variants are as follows. In 1000 CC engines category, Pak Suzuki is offering the Wagon R as basic model. Different variants of Wagon R cost as follows, right out of the factory. Yes, as we said, Pak Suzuki have more to offer in 1000 CC engines category. 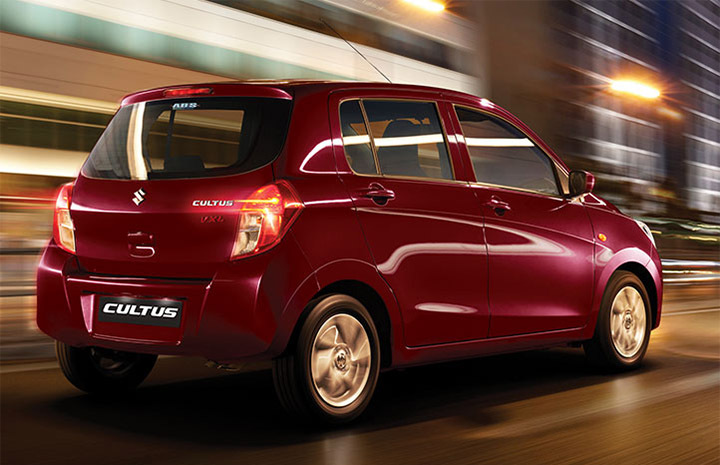 So the new second generation Suzuki Cultus is the second offering in this category. Globally, this car is known as Suzuki Celerio. Prices of its available variants are as follows. After the 1000 CC engines category, next upgrade from Pak Suzuki is offered is 1300 CC Suzuki Swift. Prices of its all variants or trims available in Pakistan are as follows in local currency. Next offering in Pak Suzuki arsenal is Suzuki Ciaz, it comes with engine displacement of 1373 CC. There are two variants available in Pakistan right now and there prices are as follows. This the entry level van offered by Pak Suzuki with most basic features. It have two variants available in Pakistan, one is for passengers and second one is for cargo. Prices of its two available variants or trims are as follows. This is Pak Suzuki’s answer to demand for luxury vans. Obviously an upgrade to its own Suzuki Bolan and obviously just available for passengers. Single trim of Suzuki APV is available in Pakistan and price is as follows. Pak Suzuki offers third generation Suzuki Jimny to its customers. This generation was first introduced in 1998. This is a four wheel drive mini SUV. Falls under three door category. Just one variant is offered here in Pakistan and price is as follows. Another very successful vehicle offered by Pak Suzuki here in Pakistan. It mini truck used for cargo or loading. You will see many on crowded roads every second. Again just one Trim is available here in Pakistan and price of it is as follows. This is the latest addition to Pak Suzuki vehicles for cargo or loading purposes. This one is much bigger than Suzuki Ravi and bit smaller than the Hyundai Shehzor or it just competes it. Again, just one trim of it, is available, which is priced as follows. Do Like our Page on Facebook and Follow us on twitter, from options on right side of this page, to stay updated with latest useful information from and about Pakistan.